Note that there are NO comments because they hadn’t been invented yet – I had to write email comments back onto the blog by hand. 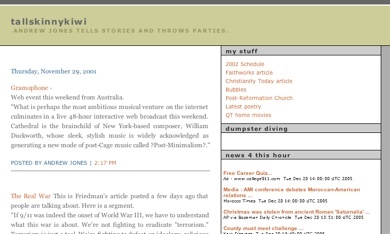 And check out my RSS news feed – a free gift from Moreover News and a very rare item on a 2001 blog – in fact – i would be interested to know if anyone out there had an RSS news feed on their blog in 2001. My QT movies of emerging churches and worship events that was started in 2000 was deleted by Apple when they decided to charge for .Mac accounts. But you can see the original page (with missing links) here. Ahhh . . . memories . . .. The WayBack Machine picks up my blog by 2002 and it looks a little better by then. But not much better. Can you believe I spelled ‘Lomographer’ wrong on my header? On June 4, 2006 I will be throwing a blog- party celebrating 5 years of tallskinnykiwi. Consider yourself invited.